When winter winds blow with ice and snow, our canine friends are at increased risk of illness and injury. Pet owners can reduce the risk of suffering with some helpful winter weather tips. Here are seven ways to keep your pooch safe and warm. Ice-melting salt - It’s convenient to keep bags of sidewalk salt nearby for easy spreading, but it can be harmful to dogs. If ingested, it can upset their stomachs, and on their paws and skin it causes lesions and cracking due to extreme dryness. Ice-melting solvents - Chemical ice-melters, including sprays and additives, can be harmful or fatal to dogs. Don’t leave your dog in the car in frigid temperatures. Their coats can’t protect them from freezing, especially if they are also wet or dehydrated. Dogs can quickly freeze to death in temperatures that might not seem too cold to you. Your car acts as a refrigerator, holding in the cold and creating a dangerous place for your pet. Ice and snow buildup can harm your pet’s paws. Check their feet after walks, especially between their toes. Limping and exhaustion can be signs of frostbite on the feet. If your pet’s toes seem too cold after a walk, or if the pads of their feet are overly dry, massage petroleum jelly into their foot pads and feet. This is most effective if you apply it before the walk, so it can create a barrier between your pet’s feet and the ground. 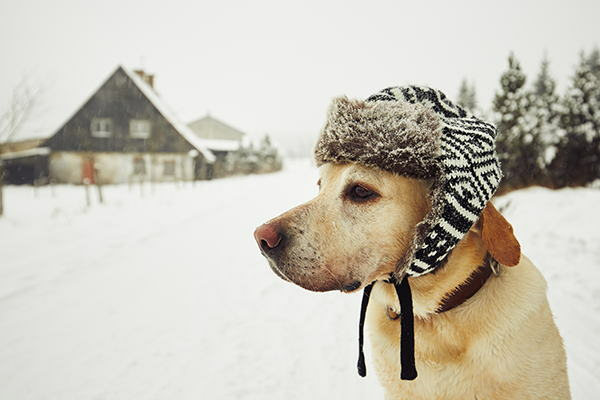 Moving in and out of cold weather can be uncomfortable for your dog. The fluctuation in temperature - plus the added impact of wind and snow - can make dogs’ skin dry and flaky. In extremely cold temperatures, keep walks short and help your pet warm up quickly when you’re back indoors. Dry them off with a towel to ensure moisture doesn’t linger on their fur. Even a small draft can create a large amount of discomfort for your dog. Check your dog’s sleeping area, because drafts are most dangerous when pets are resting and not moving around to stay warm. Is your dog’s bed next to a drafty window or doorframe? Do large gusts of wind hit them when someone opens a door nearby? Eliminate these sources of cold or move their sleeping area to a warmer spot for winter. When frigid temps hit your area, wait to give your pet a bath. Frequent washing removes oils that protect your pet’s skin. If bathing is absolutely necessary, talk to your vet about a moisturizing shampoo that will blunt the impact of removing oils. It can be tempting to shave long-haired dogs in the wintertime, when ice and snow cling to the ends of their locks. But this can actually make winter worse for your dog. Don’t shave your dog all the way down to the skin until temperatures are consistently warm again. Any coat, short or long, provides your dog with essential warmth and comfort in winter temperatures. Dogs with naturally short or absent fur may even need a sweater. Is winter weather affecting your dog’s health? Contact Academy Animal Hospital right away for an evaluation. We’ll help keep your pet safe and warm this winter.